← Creation Science Fair? No it’s not! The Baby must dry several weeks before it is ready to be sold. I’m off to buy some Baby Jesus and Lil Chub. p.s., why is there a Buddha on the banner for babyjesus.com? p.p.s., there is a band called Jesus Sausage. because you needed to know that. This entry was posted in bizarre, food, funny, religion. Bookmark the permalink. That Buddha on the BabyJesus.com website MAKES NO SENSE. IF CHEWBACCA IS FROM ENDOR, YOU MUST ACQUIT! “The Buddha needs Jesus like a fish needs a bicycle”. The Budhha says, “Jesus is OK, it’s his posse I can’t stand”. 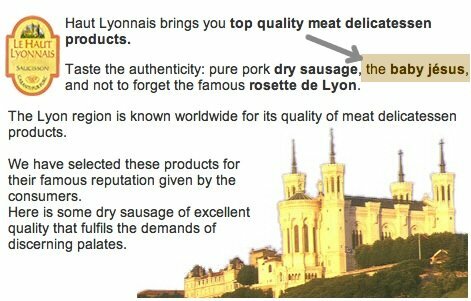 Google “jésus saucisse” and you’ll find it’s not only a real sausage, it’s a really BIG sausage. if you record “baby jesus” and play it backwards, it’s “sausage-y babe”. yep. Apparently, Jesus has balls, too. And with nuts in “small bags”!! Stop eating the baby jesus! It’s people!!! Not as popular as the Holy Grail, but true seekers still greatly desire… The Holy Foreskin. Baby Jesus sausage + Holy Foreskin = Superpowers beyond your wildest dreams. 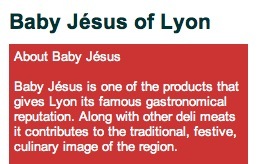 There’s also a French wine, red, I think it’s a Burgundy, that’s known as the Baby Jesus. And, saltpeter is an ingredient. The Baby Jesus delivers you from your sinful libido. To be eaten with the Virgin Mary toast?